Stone-throwing between security forces, extremists in Yitzhar overnight; more suspects arrested. Two Samaria residents were arrested on Wednesday afternoon, as news surfaced that more clashes happened overnight in the community. spokesman Micky Rosenfeld told AFP. "The situation is calm now but could escalate at any moment, and security forces are deployed at Yitzhar." Rosenfeld said there had been no casualties but that two men had later been arrested. According to Ma'ariv, the men were a 20 year-old man from Havat Gilad and a 40 year-old man from Yitzhar. Yitzhar has been the center of dramatic clashes between the IDF and an extremist element in the town this week, which began after IDF Colonel Yoav Yarom found his tires slashed outside the community. 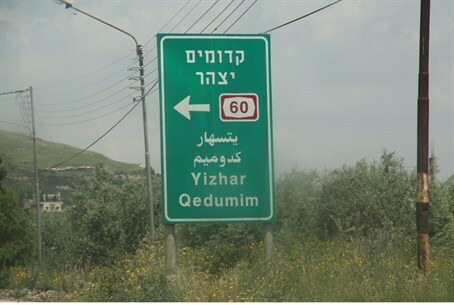 Yarom stressed to Arutz Sheva Tuesday that the Yitzhar residents themselves were helpful and apologized immediately over the vandalism. On Wednesday, leftist groups began responding to recent events in the community by urging the IDF to crack down on Jewish "settlers" in the region. The Council for Peace and Security, a left-oriented group of former senior security officers, sent a letter to the IDF Chief of Staff and to the Minister of Defense Wednesday demanding that they take an "uncompromising approach" to "price tag" attacks in Judea and Samaria following this week's clashes.